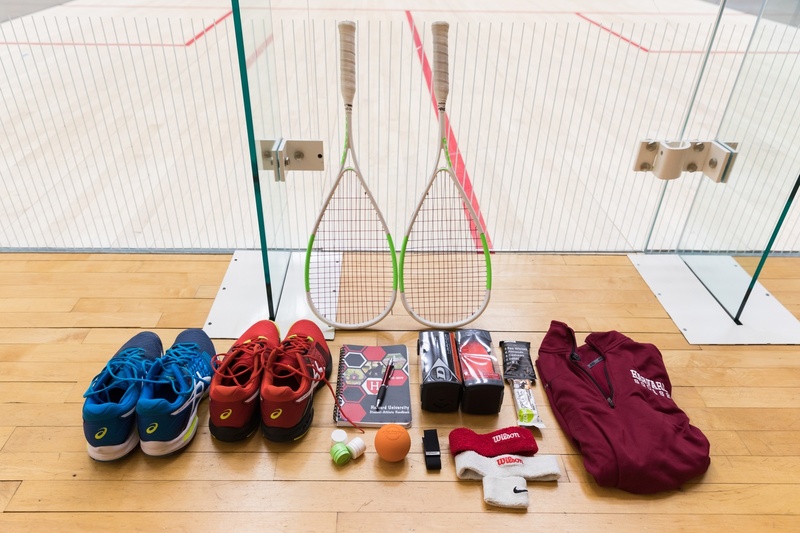 Junior Timothy Brownell, a top three player for the Harvard men's squash team, packs an assortment of essential gear in his bag. Junior Timothy Brownell has seen no shortage of success during his stint in a Harvard Crimson squash uniform. Playing in the top three for the second ranked team in the nation, Brownell has earned his spot after two consecutive All-Ivy first team nominations and an appearance in the national semifinals as a sophomore. His dominance at the collegiate level was no surprise to anyone who followed his high school career, however. Brownell― a Belmont, Mass. native― captained his high school squad for three years and earned three U.S. Squash All-American nominations before continuing his play for the Crimson. In order to achieve such a consistent level of success, an athlete must perfect every aspect surrounding their game. 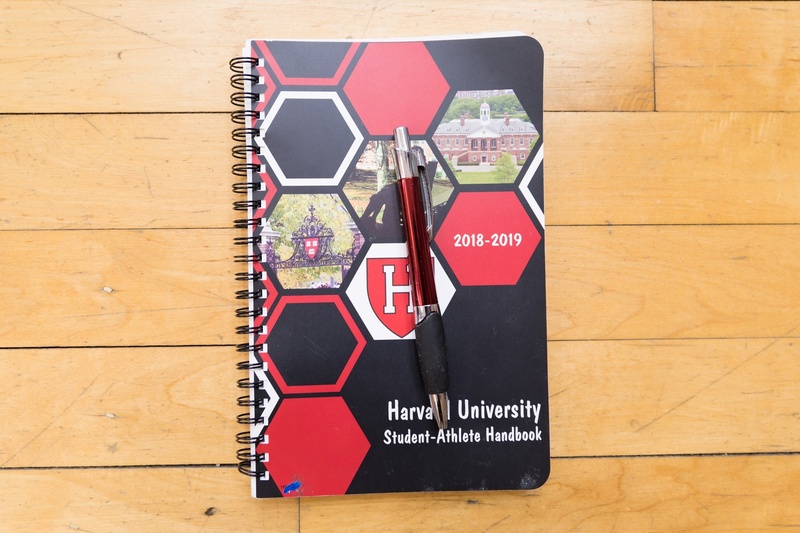 Although Harvard’s current squad is nationally ranked and loaded with talent, it lacks the same collegiate experience that some other top-ranked teams have, a disadvantage that the Crimson must make up for with extensive preparation. “Preparation is extremely important, especially since we’re a young team and a lot of the teams we’re playing are a lot older than us,” Brownell said. Brownell’s personal preparation serves as a testament to his success, as the constant maintenance of his duffel bag both before practices and matches keeps him playing at the top of his game, even in the occurrence of an unexpected mishap. From the multiple pairs of shoes that are constantly rotated to the notebook where his expectations for a match are documented, Timothy Brownell’s duffel bag covers every aspect of his game efficiently. Brownell has experimented with new shoe models after his familiar pair was discontinued after high school. The middle pocket is the main component of the bag, where Brownell stores at least two pairs of shoes at all times. The key to the bag, and to the game of squash, according to Brownell, are the shoes. This conclusion was reached after years of experience. Brownell struggled to settle with a single pair of shoes for over a year after Asics discontinued the production of the pair he used throughout high school. 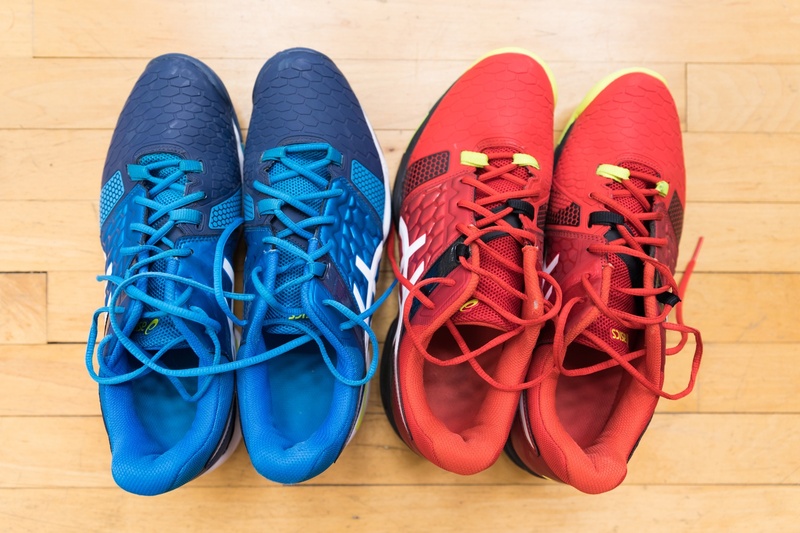 “I would have issues with them not feeling right or getting blisters,” said Brownell when mentioning the multiple pairs that he went through before finding his current go-to model, which he keeps several pairs of in different colorways. The side pocket always holds four to five racquets due to the possibility of strings breaking as often as they do in many tennis matches. Although it is rare that all of the racquets will be necessary in a single match, guaranteeing a consistent outcome is something that Brownell emphasizes through his extensive preparation. 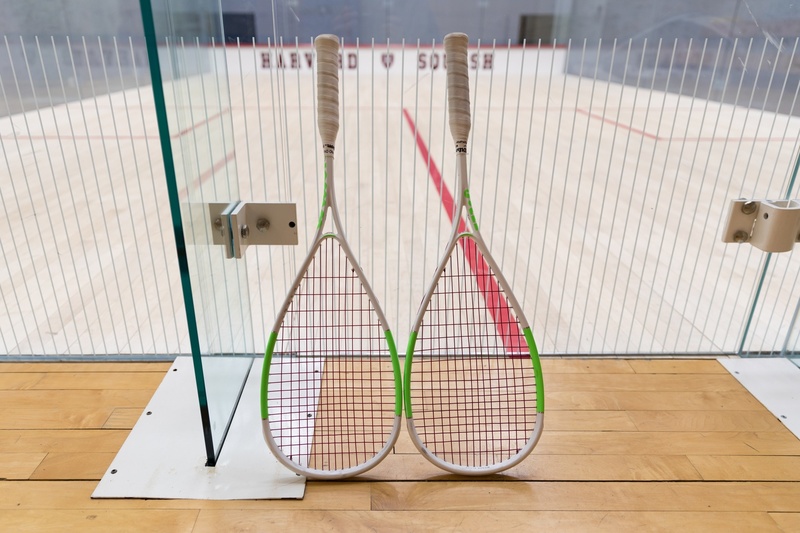 Like tennis, squash players have to be prepared to make in-game racquet switches. “You want to be able to go everyday without worrying about a single thing without the bag,” Brownell said. The theme of being safer than sorry is reiterated in Brownell’s gear. Keeping several shirts in the bag, he always leaves himself the opportunity to change between matches in order to stay as comfortable as possible. Due to the unpredictable match start times, Brownell always carries around a few snacks to maintain his energy. Perhaps the most important component of the bag, however, is one that would initially be dismissed by many. Brownell keeps a small, black notebook in his duffel bag filled with gear and equipment that is essential to performing during the matches. This handbook, seeming completely out of place, is actually his key to maintaining the proper mentality going into a match. Brownell carries a small notebook in his bag to visually prepare and script out his upcoming matches. Brownell calls it “scripting”: a process in which he visualizes and how he wants to perform and feel during a match and documents these visions in his notebook. The scripting tradition, implemented by head coach Mike Way, is extremely important for a team as young as the Crimson’s current roster. Although consistency is stressed by Brownell to be a key in his success, the nature of the sport that he plays often prevents him from getting too comfortable with his situation. From the constantly-alternating practice schedule to the inexact match times, Brownell had to adjust through experience, adding certain components to the duffel that were not there initially. In order to maintain his composure and preserve his energy going into a match, Brownell found that a simple addition to the bag was extremely effective: headphones. Squash’s inconsistent schedule has prompted another addition to Brownell’s bag: a large variety of energy-packing granola bars. 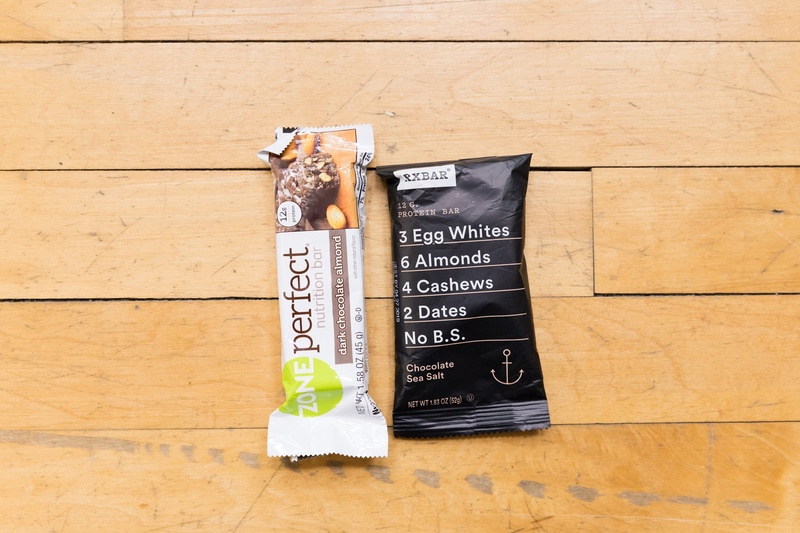 Snacks have proven to be essential during matches, as the time in which Brownell actually steps onto the court is dependant on how long the matches leading up last. In order to preserve his energy, Brownell has found the snacks to be extremely useful in his duffel. As Brownell continues his dominant season on the court, looking for another All-Ivy nomination and a successful run in the national tournament, the duffel bag will prove to be indispensable. Whether it’s the need for a better grip on his racquet or to prepare mentally before the start of a match, Timothy Brownell’s preparation will be the ultimate determinant to his success, setting an example for a young team learning to take the next step towards greatness. — Staff writer David Manikas can be reached at david.manikas@thecrimson.com.